How are farm animals treated and should one care? For the record, I am not vegetarian and I follow something similar to a paleo diet high in animal proteins and fats. But whether or not one believes animals have rights, libertarian philosopher Loren Lomasky once gave me the most succinct argument for caring about the welfare, at least some, of animals: “You wouldn’t put your cat in a microwave, would you?” But what if certain farm animals had intelligence and awareness levels in the same league as pets we care so much about? It turns out that pigs can master certain basic video game tasks that dogs and even monkey cannot, and they appear to be able to non-verbally communicate with humans or other pigs in much the same way as dogs. Regardless of one’s position on eating meat, one can still care about not intentionally inflicting pain on animals, or care that they are treated in humane ways. John Locke and Immanuel Kant adopted such a perspective. At the Fork is beautifully shot with attractive visuals throughout. It is well edited, well-paced, and accompanied with a quality soundtrack including music from executive producer Dave Matthews. A 1970s PBS documentary this is not. The movie also interviews different farmers, ranchers, politicians, business people, and scholars with different perspectives. A Michael Moore style documentary this is not, either. The film shows a range of farms; from factory farms that keep animals in close quarters, to free range farms. I appreciated that the film never showed anything close to gruesome, but bringing viewers close to the animals let viewers see aspects of how pigs, cows, and chickens for meat, dairy, or eggs live. The film shows how factory farming arose because of economic factors with consumers demanding lower prices. In a market economy, producers seek to supply whatever consumers ask for. But At the Fork also shows how many consumers are now demanding more ethically sourced meat and dairy products. One popular program that one may have observed at Whole Foods and other meat counters is the Global Animal Partnership 5 Step Animal Welfare Rating Program. This private certification program rates farming methods and gives a farm a Step 1 rating if it has “no cages, no crates, and no crowding” all the way a Step 5 if it has animal centered pasture farms. Although chains like Whole Foods are at the forefront of such movements, consumer demand is king at all price points. Temple Grandin states that most consumers dislike the idea of gestation crates when they are told about them, and at this point America’s largest pork producer, Smithfield, is phasing out the use of gestation crates, and McDonald’s, Burger King, and Wendy’s are phasing out purchasing pork from producers that use them. These are not exactly expensive food suppliers, but their actions show that greater awareness and demand from consumers can help improve animal welfare. As an economist who usually spends time reading about financial markets and alcohol, I did not know how I would react to seeing At the Fork. I ended up finding the film very moving. At the Fork is really a visual story that gets people to think about what could be abstract philosophical questions in different ways. It is also presented in an aesthetically attractive way. Even if you don’t change your mind, watch it and enjoy. Featured image credit: Cattle grazing silhouette by skeeze. Public domain via Pixabay. 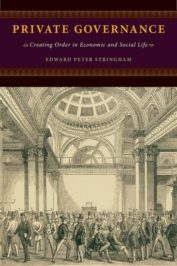 Edward Peter Stringham is the Davis Professor of Economic Organizations and Innovation at Trinity College, Hartford, Connecticut. He is the author of Private Governance: Creating Order in Economic and Social Life.